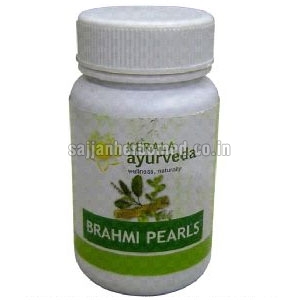 We are one of the trustworthy Suppliers of Brahmi Pearls Capsules. Prepared using herbal ingredients, our Brahmi Pearls Capsules help in improving intellect and memory. These Brahmi Pearls Capsules are considered as an exceptional memory toner, which relieves mental stress, improves learning process and provides sound sleep. Our Brahmi Pearls Capsulesare known for their purity, accurate composition, zero side-effects and high effectiveness. Dosage : 1 to 2 capsules twice daily or as directed by the Physician. Centella asiatia (Mandookaparni) Improve learning and memory process. Ocimum sanctum (Thulsi) Nootripic and antistress activity.